Join your co-workers this Saturday, Jan. 19 for the third annual OC Women’s March. Thousands of women, men, and families peacefully took to the streets in downtown Santa Ana the past two years, making their voices heard on a variety of issues. These diverse groups marched together under the idea that women's rights are human rights and with the goal of making Orange County a more safe, fair and supportive community. This year OCEA members will march to make our voices heard on the issues that we care most about. We will march because our County, Court and other public workers deserve more than the largest gender pay gap of all counties in California. We march because we deserve more than the constant under-valuing and under-funding of services provided predominantly by women, which not only hurt all of us, but inflict serious damage to our community. We deserve to be treated with respect in our workplaces and have the important work we perform taken seriously. If you would like to join other OCEA members who will march together, please plan to meet between 8-9 a.m. Saturday at OCEA Headquarters. The downtown area will be very busy Saturday morning and parking at OCEA will be available on a first-come, first-served basis. 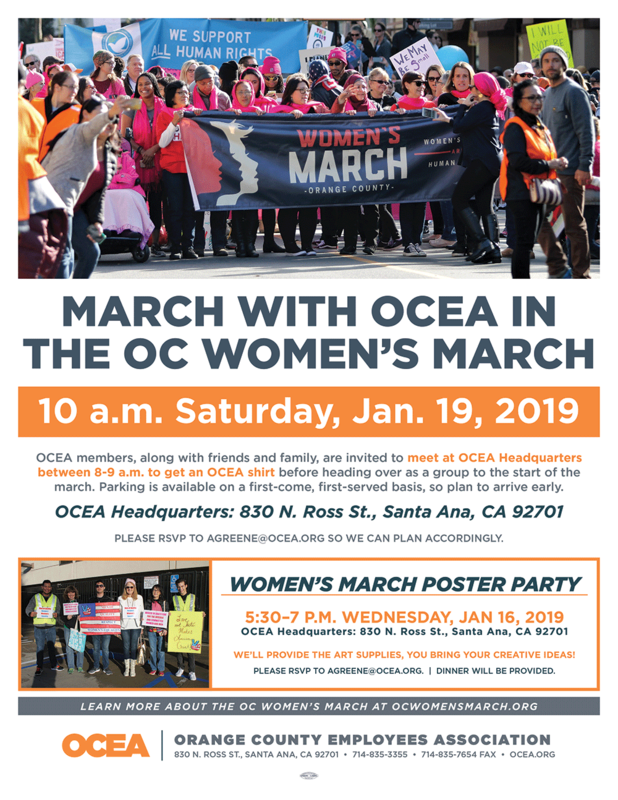 For those who plan to attend the March, we will also host a Poster Party from 5:30–7 p.m. Wednesday, Jan. 16 at OCEA. We'll provide the art supplies, you bring your creative ideas!